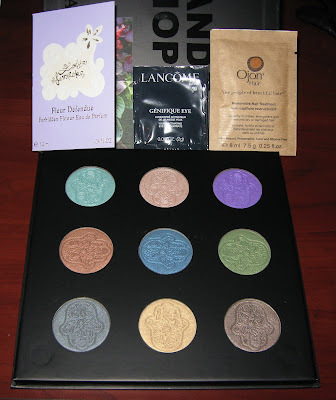 Above & Below: Cargo's Hands of Hope Eye Shadow palette and my 3 samples. This is so big, I was really surprised. The case is about 7" square. 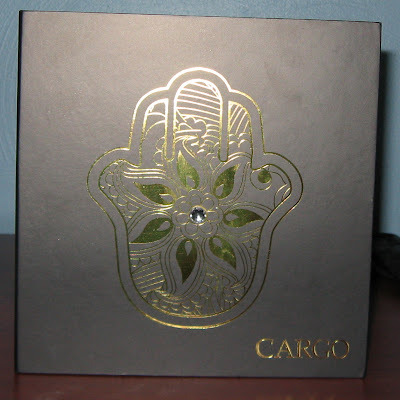 The case itself is very pretty, with a gold foil design and a little jewel in the center. It has a magnetic closure. Below: Urban Decay's Get Baked palette is a great bargain at $18.00, and I love the shades for summer. My first Illamasqua polish, in Muse. I just received my Sephora order and I love it! I used my $15.00 Beauty Insider discount code...I just couldn't let that go to waste! The Cargo Hands of Hope palette is huge. The shadows are at least the size of a silver dollar and the shades are all just lovely. This palette retails for $29.00, so that's not a bad deal, especially considering how big the product is. 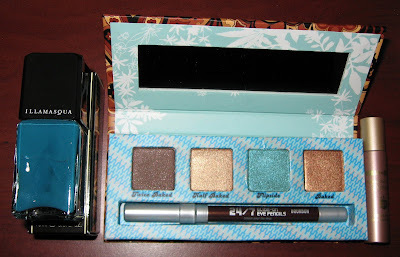 I also got Urban Decay's Get Baked palette, which is currently priced at $18.00. These are perfect shadow shades for me in the summer months, and it also came with a 24/7 pencil in Bourbon, and a mini Primer Potion in Sin. Lastly, I received my first Illamasqua, and I chose Muse. I had every intention of getting more Illamasqua polishes, but honestly, none of them really appealed to me all that much. There must be something wrong with me! Yen from Victoria Nail Supply just sent me an eMail to let me know they just received their shipment of the Color Club Exclusive Japanese glitters I showed you here earlier this week. I don't see them on the site just yet, but they should be up in the next day or two. I love the Cargo palette. I wish I could wear all those colors. I got the UD Kit too, I love their 24/7 liners, they are the only thing I've found that manages to stay on my oil lids! I just love makeup. I could look at it all day!Love both of those palettes. itskarmababy~there may be one of two (the purple!) that I won't use much, but overall, I'm hopeful the colors will work on me! Ray~thank you, I'm thrilled to have them both! Lucy~You and me both! It must be the colors and packaging, because I could look through pictures of cosmetics and spend hours at the counters just looking! That Cargo palette is a thing of beauty - so much so I don't think I could actually bring myself to use it!